Chester feels he’s a failure. He’s a disappointment to his family in America. He drinks too much. His life is mundane, going nowhere. 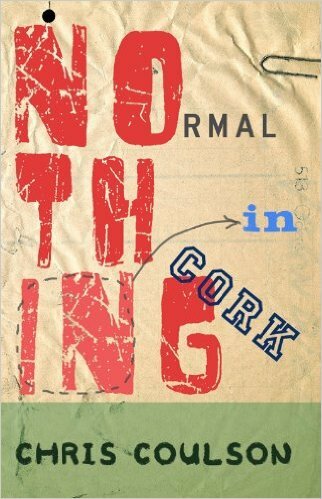 He has repeatedly made the wrong life decisions, and so he escapes to Cork, Ireland, just before his fiftieth birthday and vows to change. On or before midnight of the last day of his forty-ninth year—he will never be “normal” again. “Chris Coulson had a lot of jobs before writing this book; golf caddy, bartender, obituary writer and morgue attendant (simultaneously, night shift and day shift - had 'em coming and going), newspaper reporter, actor and other jobs less romantic. And he always carried a 50-cent Bic pen in his pocket.” Learn more about him at his website. This novel was a lot of fun. Funny, poignant, deeply introspective, and yet hope filled. The work may be more accessible if you’ve ever drunk alcohol and had one or two too many or know someone who does or has, but that isn’t necessary. The author does a fine job of outlining the benefits and the pitfalls of booze. It may also help if you’ve been to Ireland or maybe know someone who has told you tales of the Emerald Isle. Again, that is far from essential in order to enjoy the story as the descriptions of the people, the culture, the pubs, the weather, and the scenery are so vivid. The writing is lyrical, full of fresh imagery and James Joyce-like streams of consciousness (although I don’t personally enjoy Joyce, so that isn’t a prerequisite either). If you are a fellow author, and I know many of Big Al’s subscribers are, then cast aside any bias you have against the present tense. I often find present to be an awkward tense for a novel, but in this case it pulled me inside of the story and imbued the characters with a tangible warmth and closeness. The writers among you may also have to check your internal editor at the door, because Mr. Coulson happily breaks many of the normally expected rules relating to point of view. Expect to inhabit every character in the book at one stage or another, including a pepper-colored terrier. Yet, as though to prove the adage of the exception proving the rule, the head-hopping works and delivers a kaleidoscope of viewpoints and internal perspectives that add colorful layers to the tale. In my humble opinion, this is an exemplary example of why self-published books add hugely to the body of writing out there. Highly unusual, and highly recommended. I found only one minor typo, but on my Kindle there was a translation issue on quotation marks, which appeared as a strange non-keyboard character. Because the problem was consistent throughout, it didn’t spoil my reading enjoyment.